Ronaldo tries again for first goal, Inter for first win – Royal Times of Nigeria. The thirty-three-year old, however, would probably settle for a tap-in or a penalty to get off the mark for his new side when they visit promoted Parma on Saturday. Given that Ronaldo scored three hundred and eleven goals in two hundred and ninety two La Liga matches for Real Madrid, two scoreless games for Juventus is already beginning to feel like a drought — and his failure to hit the back of the net certainly has not been for want of trying. 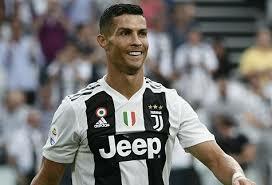 Ronaldo was denied by an inspired display by Chievo goalkeeper Stefano Sorrentino in his opening game, won three to two goals by Juventus, and again by Lazio’s Thomas Strakosha in their two nil win last Saturday. Following a one nil defeat at Sassuolo in their opening game, they squandered a two nil halftime lead against Torino last Sunday and were held to a two-two draw.